Paper cards are great, but chocolate is better. So, for our holiday card, we created a delicious ‘thank you’ branded with love by the Enlisted team. This year, we collaborated with bold visionaries and creative forces to create brands and products that people love. Looking back, we wondered... what inspired us? Turns out, all we need are good dogs, good food, and good people. Good dogs. They’re fundamental to Enlisted studio culture. Key duties include napping, looking for treats, and keeping morale high. Good food. Design teams that snack together, stay together. From cronuts to kale, we kept our taste buds inspired. Good people. We are a passionate team of diverse talents who love working with each other. United by our shared desire to build highly collaborative relationships with our clients, we are so proud of what we’ve built together. As always, you enlist our team, we enlist yours, and together we create. 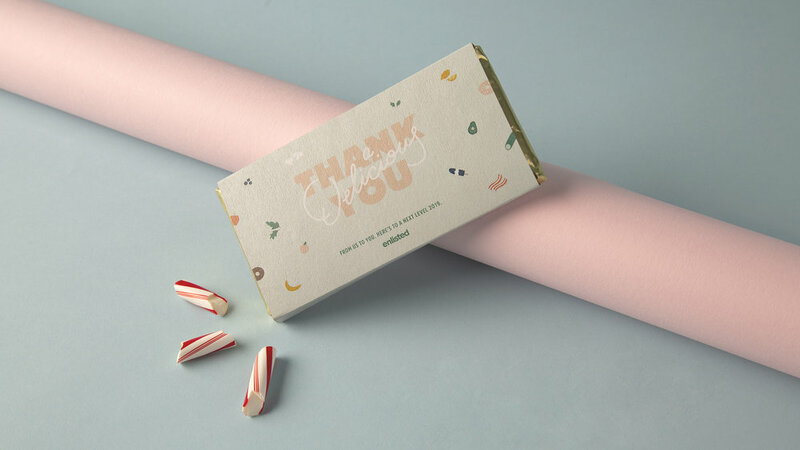 After honing in on what we love, our visual designers explored how these themes extend into three playful, illustrated patterns able to stand alone or work in a cohesive gift set.